Yesterday I wrote about how I'd gone to the effort of making homemade peanut butter in order to then deliver some low cost protein bars for the husband and I. Wish I'd not bothered. 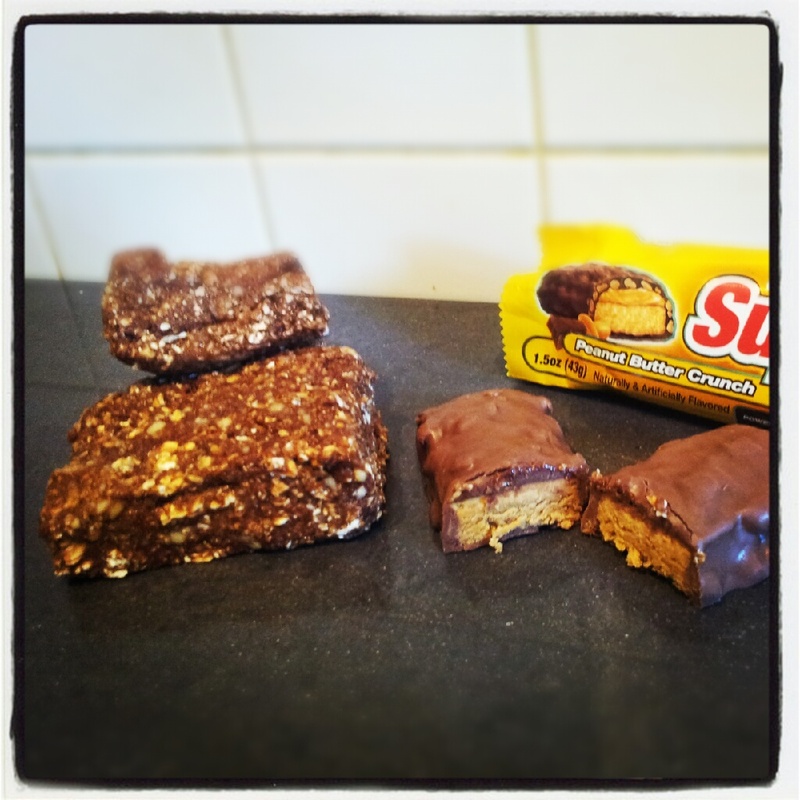 If you buy protein bars from a shop, they cost anywhere between £1.40 and £3 each. My budget option was intended to save me heaps of money - when you get through 10 a week between the two of you, it gets expensive. Instead, I'm about to either chuck £4 worth of food away or spend the next eleven days choking down my home made attempt. Despite the oatmeal and homemade peanut butter, the bars are sadly ruined by the taste of aspartame from the addition of chocolate whey protein powder. It's really all you can taste. When you make it up as a drink with milk and stick a banana in it, it's pretty palatable. Mixed into a stodgy batter, it's frankly quite disgusting. On the plus side, they kept me so full up to lunchtime and beyond that I wasn't tempted by any of the free biscuits on offer at my course during breaktimes nor did I really want my lunch (my belly thought I'd eaten a lump of putty). It did save me from snorfing the bag of crisps, flapjack and orange juice accompanying the free sandwich, that pushed the lunch well beyond the 1,000 cal limit. I seriously need to revisit the healthy, protein packed breakfast issue during the course of my new blog. There has to be something I can eat easily at work that will keep me full til lunch and isn't messy. Answers on a postcard please. If you're interested, this is the recipe I used. Word of warning, trying to clean up afterwards is akin to trying to scrape dried concrete out of a cement mixer. You won't go far wrong with a hammer and chisel. Goodness knows what it's done to my innards!